At Brock, we pride ourselves on integrating experience into our students’ studies by offering a rigorous co-op program and a variety of hands-on learning opportunities within their academic programs. Alongside this, our career team works with our students to successfully translate their experiences, both inside and outside the classroom, as they launch into their careers. Our vision is to be the leader for quality experiences in co-op, career and experiential education in Canada. We bridge learning to practice by cultivating student talent, career development and individual growth through proactive engagement of industry, academia and community. Empower students to reach their full potential. 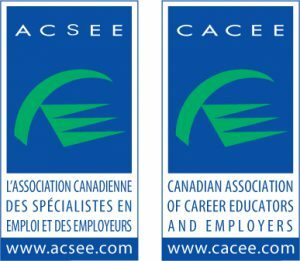 The Canadian Association of Career Educators and Employers (CACEE) is a national non-profit partnership of employer recruiters and career services professionals. Our mission is to provide professional networking and development opportunities, information, advice, and other services to employers and career service professionals. CACEE’s purpose is to help career service professionals and employers have access to strong professional networks and professional development opportunities. CACEE knows how to provide this support to our members, and relies on their ongoing input to improve and strengthen the association. Member feedback leads the work of CACEE’s committees and board as well as the specific goals of each CACEE staff member. ACSEE a pour but d’aider les professionnels des services de carrière et les employeurs à réussir dans leur travail. De veiller à ce que l’Association connaît la manière de fournir cet appui à nos membres, nous avons besoin de leur apport continu. Par conséquent, nous avons également mis au point un processus qui veillera à ce que la rétroaction des membres conduit les travaux de l’ACSEE comités et de nourriture ainsi que les objectifs spécifiques de chaque membre du personnel ACSEE. L’Association canadienne des spécialistes en emploi et des employeurs (ACSEE) est un partenariat national sans but lucratif entre des employeurs recruteurs et des professionnels de l’emploi. Notre mission est de fournir des informations, des conseils, des occasions de perfectionnement professionnel et d’autres services aux employeurs, les professionnels des services de carrière et les étudiants. As a national registered not-for-profit organization committed to supporting and promoting the meaningful and equitable employment of persons with disabilities, we believe that it is essential to partner and form alliances with groups and organizations representing persons with disabilities; and to work closely with all levels of government to influence change in policy reflecting a strengthened commitment to persons with disabilities. Developed by the Canadian Council on Rehabilitation and Work (CCRW), the WESP (Workplace Essential Skills Partnership) program prepares professionals with disabilities for the workplace and has helped more than 565 professionals with disabilities find career-related employment. Since 2005, WESP has helped jobseekers launch careers in accounting, finance, IT support, office administration, customer service, research, healthcare, bookkeeping, and law, just to name a few. WESP clients participate in multi-week group workshops designed to simulate an actual office environment. Group workshops are followed by individual job coaching. The workshops feature a full-time schedule with a customized curriculum that addresses current employment issues and trends. En tant qu’organisme enregistré national sans but lucratif, voué à soutenir et à promouvoir l’emploi équitable des personnes handicapées, nous croyons qu’il est essentiel d’alliances partenaires et former des groupes et des organisations représentant les personnes handicapées; et de travailler en étroite collaboration avec tous les paliers de gouvernement pour influencer le changement dans la politique qui reflète un engagement renforcé pour personnes handicapées. Career Edge Organization (CEO) is Canada’s largest provider of paid internships, engaging in connecting companies with qualified talent; while giving job seekers the chance to break into the workforce and launch their career. CEO focuses its efforts on helping four distinct candidate segments (new graduates, new graduates with self-declared disabilities, internationally qualified professionals coming to or whom have recently immigrated to Canada along with Canadian Armed Force Reservists overcome barriers to meaningful employment. CEO tackles the “no experience, no job cycle” by offering work experience opportunities with a paid internship model that includes coaching/mentoring, on-the-job training, industry knowledge transfer, and networking as four key pillars. Together these components offer interns the opportunity to gain the knowledge, experience and connections they will need to launch a successful career. Avantage Carrière est le plus important fournisseur de stages rémunérés au Canada. Nous mettons des sociétés avec talent incroyable, tout en donnant les demandeurs d’emploi la chance de percer dans le marché du travail et de lancer leur carrière. The Employment Accessibility Resource Network (EARN) is a community initiative, led by United Way Ottawa, that brings together in partnership employers, service providers and other stakeholders with the goal of increasing employment opportunities for people with disabilities and promoting inclusive and accessible workplaces in Ottawa. With 75 active members, our mission is to work with our partners to enable people with disabilities to participate in the labour market. Over 1600 people with people with disabilities have found employment since 2012, as a result of the efforts of our members. EARN’s core activities include learning and networking events, customized recruitment activities and an Annual Conference. In November 2016 EARN launched the Accessibility for Ontarians with Disabilities Act project; its aim is to educate and inform small and medium size business about the Act. This project is being delivered in the City of Ottawa, and in Lanark and Renfrew Counties. At Enbridge, we exist to help fuel the quality of life for millions of people across North America. Whether it’s oil, natural gas or renewable power, our North American energy network connects millions of people with the energy that helps fuel their life, every day. Enbridge’s success is built on a diverse and respectful workplace. We are committed to upholding our company values of integrity, safety, and respect, and believe a workplace should be welcoming and inclusive for everyone. We encourage diversity in our workforce because we understand that different backgrounds, abilities, and perspectives will help keep us innovative and dynamic. Through continual renewal and development of positive policies and programs, Enbridge builds a workplace that is equitable, respectful and free from harassment. Recognized as one of Canada’s Best Diversity Employers, Enbridge celebrates diversity. Enbridge will build and leverage a diverse workforce and inclusive workplace through leadership capability and organization capacity. Every employee and leader will be committed to an inclusive work environment that maximizes employee engagement, fosters collaboration, and is a source of learning and innovation. La raison d’être d’Enbridge est d’alimenter la qualité de vie demillions de gens, à la grandeur de l’Amérique du Nord. Nos réseaux de transport d’énergie relient des millions de personnes au pétrole, au gaz naturel et à l’énergie renouvelable don’t elles ont besoin pour vaquer à toutes leurs occupations, chaque jour. Le succès d’Enbridge repose sur un milieu de travail diversifié et respectueux. Nous nous engageons à respecter nos valeurs d’intégrité, de sécurité et de respect, et nous croyons qu’un milieu de travail doit être accueillant et inclusif pour tous. Nous encourageons la diversité de notre main-d’œuvre car nous comprenons que les différents horizons, capacités et perspectives nous aideront à rester innovateurs et dynamiques. Grâce à un renouvellement continu et à l’élaboration de politiques et de programmes favorables, Enbridge construit un milieu de travail équitable, respectueux et exempt de harcèlement. Reconnue comme l’un des meilleurs employeurs de la diversité au Canada, Enbridge célèbre la diversité. Prism Energy, notre groupe de ressources pour les employés LGBTQ, reflète notre engagement envers l’intégrité, la sécurité et le respect de tous nos employés. Enbridge est un fier membre de Fierté au travail. Enbridge construira et tirera parti d’une main-d’œuvre diversifiée et d’un milieu de travail inclusif, grâce à sa capacité de leadership et à sa capacité organisationnelle. Chaque employé et dirigeant sera engagé dans un environnement de travail inclusif qui maximise l’engagement des employés, favorise la collaboration ainsi qu’une source d’apprentissage et d’innovation. Jobpostings.ca is Canada’s top online student job network, helping post-secondary students find their first internships, co-ops, and entry-level jobs to launch their careers. Magnet is a not-for-profit, data-driven, technology hub that combats unemployment and under-employment. Founded in 2014 by Ryerson University and the Ontario Chamber of Commerce, Magnet is a collaborative hub of post-secondary institutions, not-for-profits, government, labour, and industry partners working together to one common platform, towards one common goal. It utilizes an advanced job matching technology and a blind recruitment model that can effectively, and efficiently job match people who experience barriers to employment with opportunities reflecting their skills, preferences and talent. Proudly diverse and intentionally inclusive, Ryerson University is deeply committed to creating spaces where you can bring your whole self to work. Ryerson’s academic plan, Our Time to Lead outlines fourteen values for Ryerson. Among those are community, inclusion, respect for Aboriginal perspectives, equity, diversity and access. It is through the hard work of every member of our community that these values are embedded within the university’s culture. The Office of Equity, Diversity and Inclusion collaborates across campus to make Ryerson a truly inclusive place to learn and work. At Ryerson, having faculty and staff who reflect the diversity of our students and our city makes us a better university. The Employees with Disabilities Community Network includes faculty and staff who experience both visible and nonvisible disabilities. Members provide a diversity of perspectives and experiences of living and working with a disability. Ryerson University is committed to providing an accessible environment for members of the Ryerson community. We are committed to the principles of the Accessibility for Ontarians with Disabilities Act (AODA), and aim to ensure that dignity, integration and equality of opportunity are embedded in all aspects of the university culture. SFU Career and Volunteer Services supports SFU’s Vision of preparing students for an ever-changing and challenging world by working with academic and service partners to embed career thinking into the university experience and by supporting students to intentionally work towards career possibilities. The organization is a neutral forum for gathering and exchanging ideas, information and knowledge on Human Resources and best practices in training. Our focus is on trucking and logistics needs within the freight transportation network. Nous sommes une organisation nationale fondée sur le partenariat avec les autres dans l’industrie, nous favorisons la fourniture de services de camionnage sûrs, efficaces et professionnels au Canada. L’organisation est une tribune neutre pour collecter et d’échanger des idées, et l’information sur les ressources humaines et les meilleures pratiques en matière de formation. The University of Toronto Career Centre engages, empowers, and supports current and prospective students, and recent graduates as they create their life goals. Working with strategic partners, we offer career education and experiential opportunities that foster career clarity and build skills and lifelong competencies. Le Centre de carrières de l’Université de Toronto implique, responsabilise et soutient les étudiants actuels et futurs, ainsi que les jeunes diplômés, dans la définition de leurs objectifs personnels. En collaboration avec nos partenaires stratégiques, nous fournissons des informations scolaires et professionnelles et offrons des occasions de vivre une expérience pratique pour faciliter le choix de carrière et permettre l’acquisition de compétences tout au long de la vie.